Helmets keep cyclists safe but here are 5 things you probably didn't know about bicycle helmets. When I had first started working as a bike mechanic, I was able to ride my bike to work without much effort. One of the first days I rode to work I didn't wear a helmet. When I walked into the shop the head mechanic asked if I enjoyed working there. I told him I did and he said that if I wanted to keep working there, it was a requirement to wear a helmet. He told me that as a bike shop employee people in the community watched how I rode and that if I didn't wear a helmet for my commute, people would think that helmets were unnecessary since the mechanics didn't wear them. Ever since that day, I have worn a helmet whenever I ride a bike. While they might not be the most popular things in the world due to appearance, price, or the fact that no matter what you do your hair will always get messed up; helmets are an aspect of life that all cyclists should make an integral part of their riding culture. 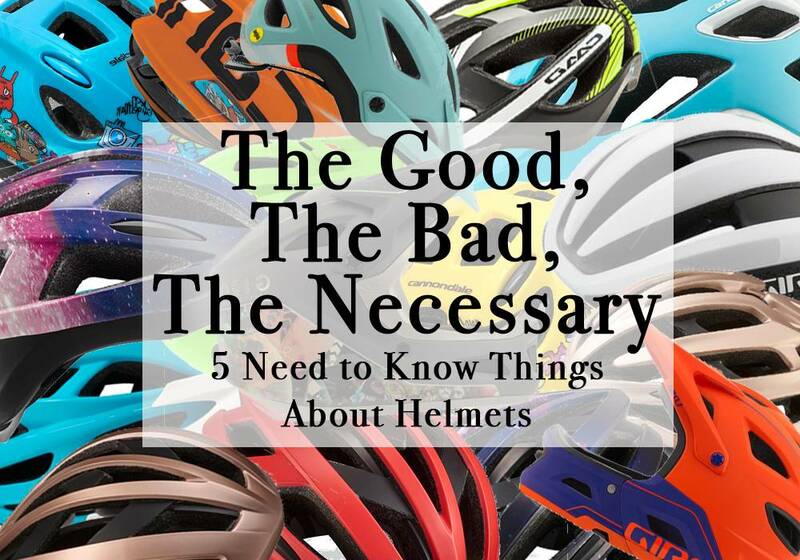 Here are 5 things that you should know as you endeavor to maneuver the complex world of cycling helmets. If you have any questions, any of us here at Noble Cycling can get you an answer. Mips is a recent buzzword that has the cycling industry excited about helmet technology and the future of innovation. MIPS is an acronym for the Swedish designed Multi-directional Impact System. I too much prefer using the term MIPS. The history of the system involves different kinds of crashes where the actor should wear a helmet. Researchers analyzed ski crashes, bike crashes and other types of accidents. They found that these types of crashes typically involved a type of impact that had long gone unaddressed and was the result of many head injuries. Broken down, MIPS is an element of a helmet that protects the rider's brain from damage during a crash using what the industry calls 'slip-plane technology'. This slip-plane technology implements a system in which the helmet can move independently of the rider's skull to absorb any rotational force which commonly results in brain injuries. Many of the top helmet manufacturers have implemented the MIPS system, or something like it, in order to better protect cyclists. The use of a helmet reduces the odds of a head injury by 50%. The odds of damage to the face or neck are dropped by 33%, so there’s that. In their reports, researchers found that helmets provided cyclists with an incredible amount of protection. However, they also found that while helmets protect riders, many riders forego wearing a helmet for various reasons. Getting more specific, the number of head traumas for those over 20 is about 5x the number of those under 18. This points to the inclination that while parents are good at making rules for children, they are not so good at keeping them. Wear a helmet and don't end up in the hospital. It might be my vanity talking but its true, no one looks good in a helmet. However, you do look better in a helmet than in a hospital. The new age of helmets allows manufacturers to create all sorts of different color options and even with high visibility colors. The other option is a full face helmet where you look like Darth Vader on steroids, think of a Darth Vader and Lance Armstrong hybrid. Anyways, helmet fashion is a thing and it gets better every year with the new integration of more compact protection and new color schemes. All good things come with time. Most helmets should be replaced every 5-7 years with manufacturers advising replacement every 3 years. After that point the foam and other protective barriers have broken down to a point that they lose some of their protective properties. Additionally, whenever a helmet is involved in a crash, it should be replaced. Most manufacturers offer a crash replacement program. If you are unsure of whether or not your helmet needs replacing, bring it in and we can help you determine if its time for a new helmet. If your current helmet is cracked or dented, you should highly consider finding a replacement as your helmet is unsafe to ride in and in court, your helmet won't hold up. Just saying. 5. Different Kinds of Cycling Come with Different Kinds of Helmets. Different kinds of riding have different needs when it comes to picking out a helmet. For mountain biking, helmets off more protection and often extend down the back of the skull of offer extended protection to the whole of the skull in the event of a crash. These helmets are commonly equipped with MIPS technology and are not as well ventilated as a road helmet. For those riders that are strictly riding on the road, ventilation is a huge concern. When out on a 60-mile loop, the last thing a rider wants is a helmet that doesn't breathe well. However, for commuting, riders often want the most comfortable helmet available in some awesome color choices. There are lots of kinds of helmets and they all serve a purpose. Come to try one on and see what your needs are as a cyclist. The world of helmets is a treacherous place to negotiate alone. For that, we have the Noble Cycling team to help you figure out what the meaning of a helmet is and where it falls in your life and in your ride. However, for some of us, our life is the ride. Be safe, and for goodness sakes wear a helmet. So You Want to Buy a Mountain Bike.